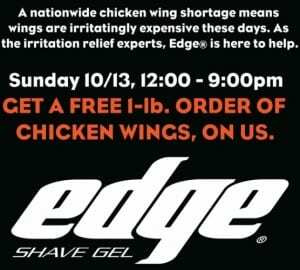 Free 1 Pound Wings at the Greatest Bar on Sunday, October 13, 2013 from Edge Shave Gel! Today is a big day. Patriots AND game 1 of the ALCS! If you are heading to a fine drinking establishment in the city today, you may be interested to know that Edge Shave Gel will be at the Greatest Bar today. And more importantly, they will be giving away a free 1-lb order of chicken wings from 12-9pm today, 10/13/13! For more information, head to the Greatest Bar website, and scroll down the page to find this fun promotion! To find even more great bar deals available on Sundays, please head here. Important: If you do head to check out this promotion today on the early side, do you mind leaving a comment or tweeting at me to let me know your experience. I’m on the fence and I want to know if I should change my lazy Sunday (football) plans. Free wings MAY motivate me, so please let me know if you go!